John Lahr's new biography, "Tennessee Williams: Mad Pilgrimage of the Flesh" (2014) inspired me to read Williams' short novel, "The Roman Spring of Mrs. Stone" (1950). Lahr discusses the novel at length in the context of Williams' life, together with many other works of this American writer. Williams wrote "The Roman Spring of Mrs. Stone" in the late 1940s while in Rome following the success of "A Streetcar Named Desire". His working title for the book was "Moon of Pause", a phrase used several times in the work to describe its heroine's condition. Williams wisely changed the title to its more evocative final version. The story is set in post-WW II Rome at the time of Williams' visit. The book captures the ambience of the city in both the beauties of its past and in its difficulty and poverty at the time of Williams' stay, including the large presence of American tourists. The language of the novel is slow, deeply descriptive, poetic, and full of symbolism. The result is a book dense to read for all its brevity. The primary character of the book, Karen Stone, is a widow in her early 50s who has lived in Rome for three years following the death of her wealthy husband. Mrs. Stone had been a popular actress but left the stage following a failure in middle-age as Juliet in Shakespeare's play. Mrs. Stone contends with the loss of her husband, the loss of her career, and the change of life. More broadly, she is concerned with aging and the loss of her beauty. The story moves back and forth between Mrs. Stone's new life in Rome and her earlier life. Her marriage had never brought her sexual fulfillment. She had pursued her career with passion and force and a spirit of fierce competitiveness. Mrs. Stone could be ruthless against those whom she deemed stood in her way. With her husband's death and the end of her career, Mrs. Stone finds herself living in "a drift". She needs to learn and to pursue what she wants out of life. Most of the book revolves around Mrs. Stone's affair with a young gigolo, Paolo. During her time in Rome, Mrs. Stone had used the services of a procuress, the Contessa, to bring her young men. She declined to become involved with the first three young men but became deeply attracted to Paolo. The young man, of course, attempts to bilk Mrs. Stone of her money but she sees through the scheme and tries to lead Paolo along for her own purposes. The relationship proceeds uneasily before its stormy conclusion. In the meantime, Mrs. Stone has been stalked by a strange, impoverished young man, one of many in the Rome of the time. When she and the gigolo part ways, Mrs. Stone is prepared to welcome the stalker, without introductions or knowledge, into her bed. 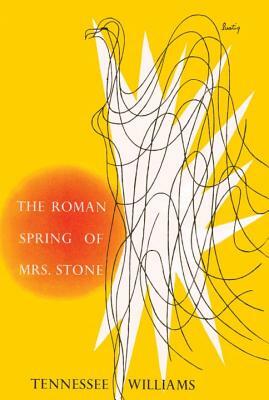 "The Roman Spring of Mrs Stone" is a beautifully told story about taking risks and about coming to terms with aging. The book gets its force from Williams emphasis on emotion and the consequences of its long repression. Mrs. Stone comes to know herself through an acknowledgement of her sexuality and a commitment to pursue it wherever it may lead at a point past mid-life. Some authors would use the conditions Williams' describes -- the feeling of emptiness and drift late in life -- as the basis for a religious or spiritual resolution. Williams' book echoes these themes, but Mrs Stone finds herself pursuing sexuality. Williams' quest -- the "mad pilgrimage of the flesh in Lahr's title -- is still both poignant and retains the quality of paradox if not the capacity to shock. This highly internalized novel shows great insight into and feelings for its primary character. In its treatment of aging, "drift", and sexuality, the story touches universal themes that transcend Karen Stone. Readers interested in Tennessee Williams or in relatively neglected American novels will enjoy "The Roman Spring of Mrs. Stone."